Question 1: if a Hong Kong company's shareholder and director all be Mainland PRC resident, will this Hong Kong company's financial information automatically transfer to Mainland PRC's authority? Answer 1: may not. As long as the Hong Kong company's main business is Hong Kong local business and the business nature isn't investment holding etc., CRS will not penetrate the company and submit financial information to Mainland PRC's authority. Question 2: any Rules regarding the definition of tax residence under OECD, i.e., under CRS? (b) (where the entity is not a company) the entity is constituted under the laws of Hong Kong, China; or if the entity is constituted outside Hong Kong, China, being normally managed or controlled in Hong Kong, China. The legal concept “normally managed or controlled” does not require that both management and control be exercised in Hong Kong, China. “Management” refers to the management of daily business operations, or implementation of the decisions made by top management, etc. “Control” refers to the control of the whole business at the top level, including formulating the central policy of the business, making strategic policies of the entity, choosing business financing, evaluating business performance, etc. definition provided here is: “Tax residents of reportable jurisdictions” refer to those who are liable to tax by reason of residence in the jurisdictions. 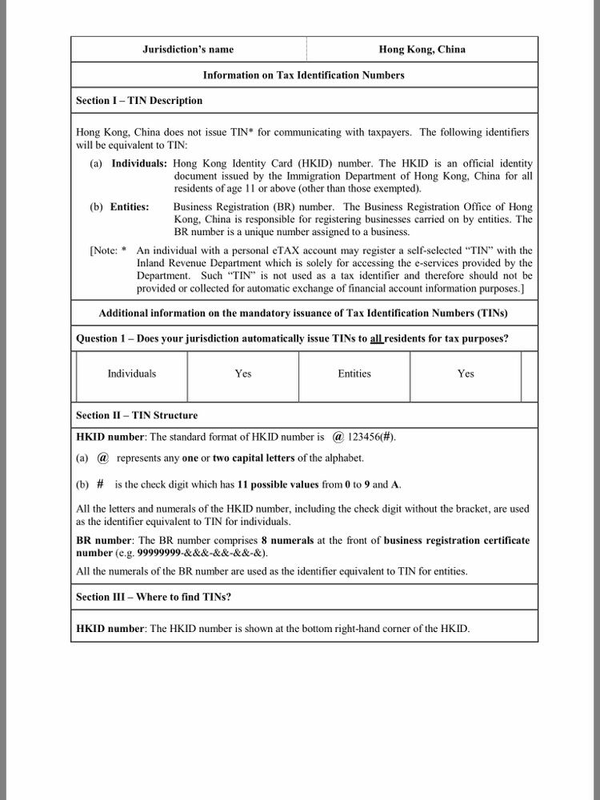 Question 3: What's my Hong Kong tax TIN (Tax Identification Number)? Extra from HKICPA's notice email: The Organization for Economic Cooperation and Development (OECD) issued the Resumption of Application of Substantial Activities Factor to No or only Nominal Tax Jurisdiction (the OECD document) in November 2018. The OECD document imposes a global standard that requires "no or nominal tax jurisdictions" to introduce "substantial activities requirement" in order for their tax regimes not to be considered as harmful tax practices. The objective of introducing such substance requirement is to level the playing field and prevent shifting of profits derived from certain mobile business activities to tax-neutral jurisdictions. In view of the above, a number of tax-neutral jurisdictions such as Bermuda, the British Virgin Islands and the Cayman Islands have enacted domestic economic substance legislation effective from 1 January 2019. Sanctions for non-compliance include monetary penalties, entity strike-off and spontaneous exchange of information with other tax authorities.